We often picture success as a horizontal line slanting upwards, reaching planes so high you can no longer see where the journey originated from. In hearing from those who have actually reached the mountain top so to speak, you come to learn that it is quite the contrary. Much like the lines in a heart monitor there are many ups and downs. 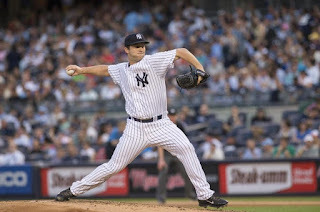 It seems like every sports writer is asking how long Adam Warren is going to have to answer questions about the possibility of being taken out of the rotation and perhaps a demotion. Here I am wondering to myself, why should he even have to? Does no one see what is going on here? In only his 3rd year in the big leagues, Adam Warren is showing some steady progression and has shown it when it has counted the most. He has already pitched more innings than anyone on the team not named CC or not under pitch restrictions. Before Thursday's loss to the Astros, Katie Sharp shared with the twitter world that Warren had a 2.81 era in his last 4 starts that resulted in losses. He has had 9 consecutive starts for which he has allowed 3 runs or fewer which is tied for 5th place in the Majors this season. Three times Warren has completed 7 innings of work and was only in line for the win in one of them. In case you are wondering, I am not trying to soften the blow of his assumed demotion by recounting his misfortunes. I am merely painting a picture of a situation we all go through. The only reason Warren's name is in the conversation for demotion is due to politics. It doesn't matter that Nathan Eovaldi has greatly benefited from run support or that he has been erratic. It doesn't matter that we no longer know who CC Sabathia is. What matters is that if you take either of them out of the rotation it would be an admission of failure from the decision makers. It shows that Martin Prado was not worth trading. It shows that once again, the Yankees overpaid an aging player. This shouldn't be about them having more time in the major leagues than Warren. As streaky as baseball can be, wouldn't you want to play the hot hand? Moving Warren because of these factors would be like releasing A-Rod because you don't like him. Both will deprive you of solid production and guaranteed wins. Politics at its finest. The Adam Warrens of this world may be the following: a college graduate with a degree who lost a job opportunity to a guy named Jimmy because "he knows a guy who knows a guy". An employee who missed out on a promotion because the boss gave it to his buddy. A victim of favoritism. One who is undervalued, taken for granted, or underestimated. Even those who have been friend zoned by your crush. We have all one way or another passed through this. And this is why we should cheer Adam Warren on.